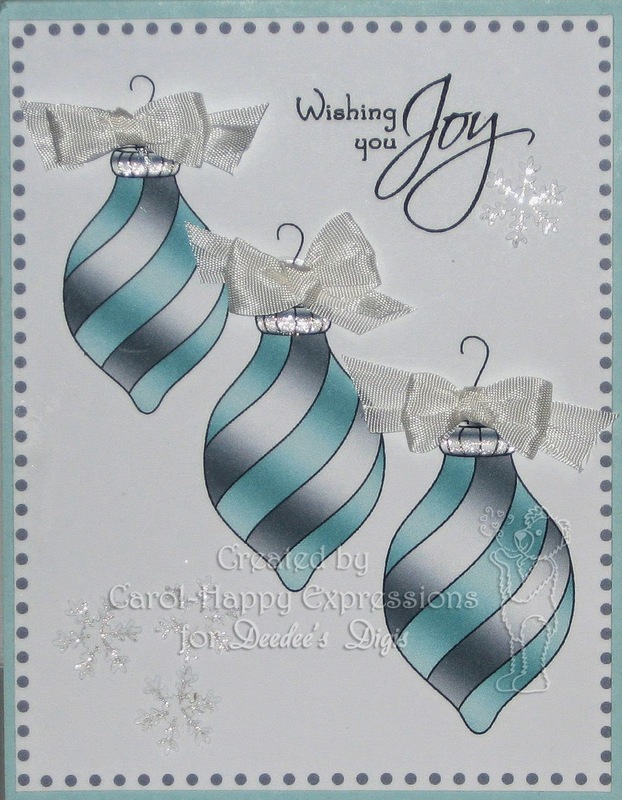 I made these two beautiful ornament cards using Deedee's Digi designs. I created the design in MS Word using the pre colored images. I printed them onto neenah cs. I love the soft colors. On both of the images I have used the same image. border and sentiment. On the first card I added some CTMH seam binding bows on each of the ornaments. I stamps our a few snowflakes added sparkle to them and I think it turned out really adorable. 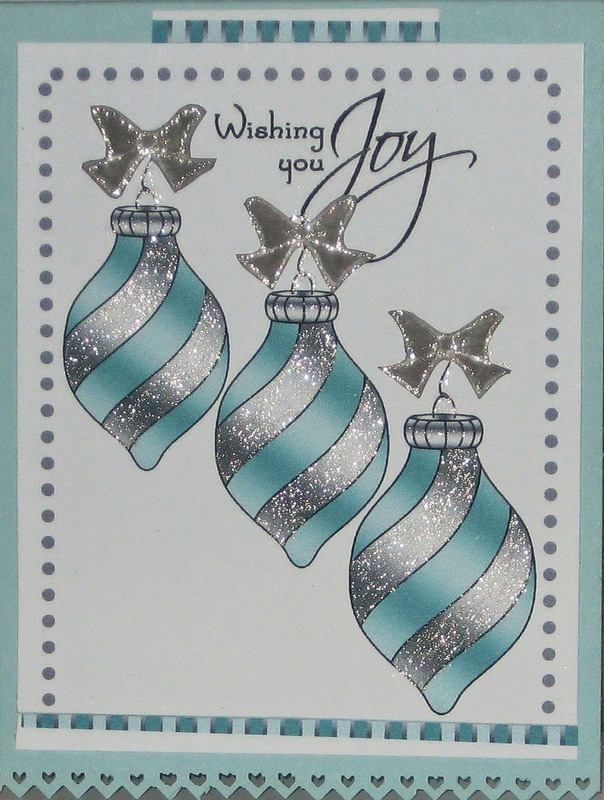 On the second image I added sukura glitter pen to the ornaments and the stamped bows and it sure turned into a wow card. I printed out one of the paper sheets in the set and used some of it for a top and bottom border. I used SU soft sky cs cut 4.25 x 5.5. I cut the front bottom of the sky blue card stock using MS border punch. I really like how the both turned out. I hope you have enjoyed them. There is always a new digi for the month challenge at Deedee's. It would be wonderful if you would join us. It's time for a new Digi of the Month challenge! 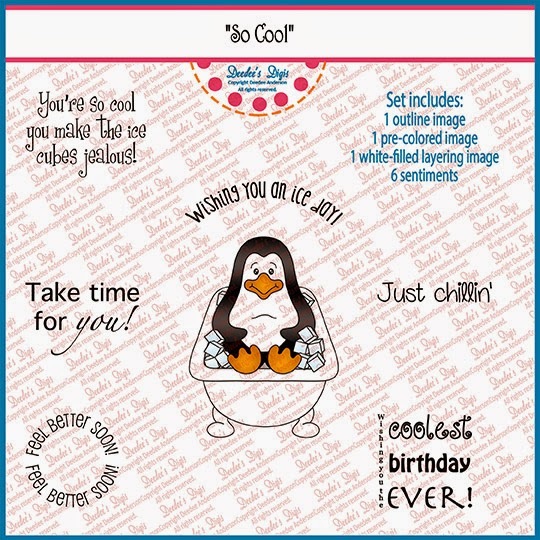 This month, our little penguin friend is beating the heat in "So Cool." Wouldn't this make some fun summery cards, scrapbook pages, and projects? 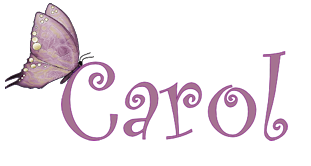 Labels: deedee digi designs, MS border punch, Neenah card stock, SU, sukura glitter pen. Beautiful - and easy to do. Got to order that digi set. TFS.